Todds Pasture in Hawnby, near Helmsley, Yorkshire sleeps 8 people. Todd’s Pasture near Helmsley has nestled in the side of a beautiful valley just outside the picturesque village of Hawnby since the 17th century. 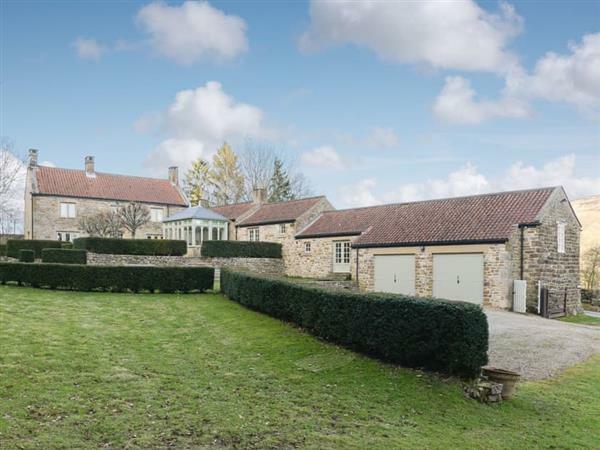 Surrounded by the North York Moors National Park, this detached property is simply stunning and is everything you would want from an old Yorkshire farmhouse. Todd’s Pasture has been renovated throughout but still retains its sense of history. No expense has been spared and visitors are ensured of luxury throughout. On arrival visitors are welcomed by a traditional boxed hedge garden and large flag stone patio. There is a flight of steps up to the main house, as well as a level entrance to the rear. Entry is into a small entrance hall and then into the large kitchen. This room oozes character and certainly has the WOW factor! With vaulted ceiling, beams, wood burner, handmade work tops and cupboards, Aga and central island, this social area will soon become the heart of your holiday experience. There is comfy seating around the wood burner where you can sit and relax whilst enjoying watching the cook in the family make you delicious meals. There are double doors that lead into the sun room which has a large table ideal for enjoying light meals. The formal dining room has a large feature table and enough seating for everyone to gather together. In the central hall you will find a downstairs toilet and cloakroom as well as the entrance to the living room which has three huge comfy settees surrounding the wood burner. The large flatscreen TV is wall mounted above the fireplace to ensure everyone can enjoy evening entertainment. Along the corridor from the kitchen and down a couple of steps, there are two bedrooms offering ground floor accommodation with zip and link super king-size beds and en-suite bathrooms. Both rooms have lovely garden views and are ideal should you struggle with stairs. Upstairs there are two further bedrooms, both with en-suite facilities. One has a king-size bed and the other has a zip and link super king-size bed. All of the bedrooms are beautifully decorated and furnished to an exceptionally high standard. With deep mattresses and luxurious bed linen you are assured a great night’s sleep guaranteeing you will wake refreshed and ready for another day exploring the North York Moors. Todd’s Pasture is only 8 miles from Helmsley which is arguably one of Yorkshire’s finest market towns. This wonderful village is where the North York Moors and the Howardian Hills meet offering some of the finest views and countryside. Helmsley is also a walker’s paradise where the Ebor Way meets the Cleveland Way, and also the Inn Way. With a reputation for great Yorkshire hospitality, the market square is a meeting point for walkers, cyclists and locals alike. Helmsley knows how to keep its visitors happy, with many shops, cafés, eateries including Michelin starred restaurants, an open-air swimming pool, walled garden, castle, bird of prey centre, microbrewery, two abbey ruins and the stately home of Duncombe Park. You will need more than a few nights at Todd’s Pasture to experience all that this little town has to offer. The scenic east coast is easily accessible, as is the historic city of York which is only 24 miles to the south. Fishing can be arranged on the local River Rye (at cost). The nearest shop is 1 mile from Todd’s Pasture near Helmsley, with the pub and restaurant 6 miles from Todd’s Pasture. 10 steps to entrance (with alternative level access). Living room: With wood burner, 43 Freeview Smart TV, Blu-ray player and DVD player. Kitchen: With breakfast area, wood burner, electric range with ceramic hob, microwave, fridge/freezer, dishwasher, beams, vaulted ceiling and stone floor. Bedroom 1: With zip and link super king-size bed (can be twin beds on request) and en-suite with bath, shower cubicle and toilet. Bedroom 2: With zip and link super king-size bed (can be twin beds on request) and en-suite with bath, shower cubicle and toilet. Bedroom 4: With king-size bed and en-suite with bath, shower cubicle and toilet. Oil central heating (underfloor in kitchen, Bedroom 1 and Bedroom 2), electricity, bed linen, towels, Wi-Fi and logs for wood burners included. Travel cot and highchair available on request. Welcome pack. External games room with table tennis table and dart board. Large enclosed lawned garden with patio, garden furniture and barbecue. Bike store. Private parking for 4 cars. No smoking. Please note: The property has a natural water supply from a spring. There are 10 steps in the garden. Holidays at Todds Pasture run from Friday to Friday. Pets allowed at Todds Pasture. For a better idea of where Todds Pasture is, you can see Todds Pasture on the map below. Todds Pasture is in North Yorkshire; should you be on the lookout for a special offer, you can find all the special offers in North Yorkshire. It's always worth checking to see what is on offer at the moment. Do you want to holiday near Todds Pasture (UK10715), you can see other cottages within 25 miles of Todds Pasture; have a look to find your perfect holiday location.